We all want to be happy. But what is happiness and what makes us happy? We may assume that material abundance will make us happy. If we ask wealthy people, however, they will certainly assure us that being rich does not guarantee happiness. For one thing, the richer you are, the more you want. We all have insatiable lust for wealth. Besides, family disputes over money and inheritance frequently happen among rich people and they always turn ugly, destroying an otherwise happy family. Happiness also comes when you do what you like most. That is, if you enjoy your job and find it worthwhile, you are a happy person. Schweitzer also stated, “Success is not the key to happiness. Happiness is the key to success. If you love what you are doing, you will be successful.” In Korea, parents often tend to force their children to become a lawyer or a medical doctor. But if your children do not have aptitude in those professions, they will end up being unhappy and miserable. Parents should let their children choose the jobs they like and enjoy most. One’s environment is crucial to happiness, too. Living in Malaga, Spain, these days, I am so happy because every day I can enjoy beautiful weather, gorgeous costa del sol, delicious gourmet dishes, inexpensive living costs, seemingly inexhaustible tourist attractions, and nice and friendly people who are ready to help foreigners. Every day, I am privileged to breathe fresh air without worrying about micro dust, and appreciate the magical blue sky and the enchanting Mediterranean Sea. Certainly, those things make me one of the happiest souls on earth. Indeed, we will be happy if we are grateful for what we have, instead of comparing ourselves with others and complaining. Roy T. Bennett said, “If you are not grateful for what you already have, what makes you think you would be happy with more?” David Steindl-Rast also stated, “Happiness does not lead to gratitude. Gratitude leads to happiness.” In order to be happy, then, we should learn to be grateful for and content with what we have. According to “The Daily Crescent,” happiness is like a butterfly, “which, when pursued, seems always just beyond your grasp; but if you sit down quietly, may alight upon you.” Like the Bluebird in Maurice Maeterlinck’s story, happiness may be near us in plain sight. If so, all we need to do is to feel it and find it in the plain things around us. 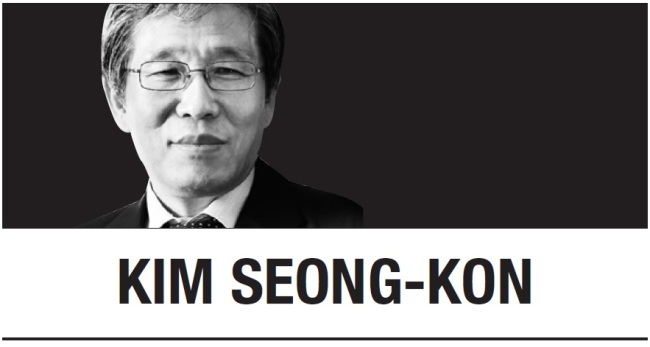 Kim Seong-kon is a professor emeritus of English at Seoul National University and a visiting professor at the University of Malaga in Spain. -- Ed.